This Saturday morn, TLC and Her Hubby had gone to look for a fridge for their new casa. LL and Grammy were on our last ever walk to the Duck Pond. (Yes. 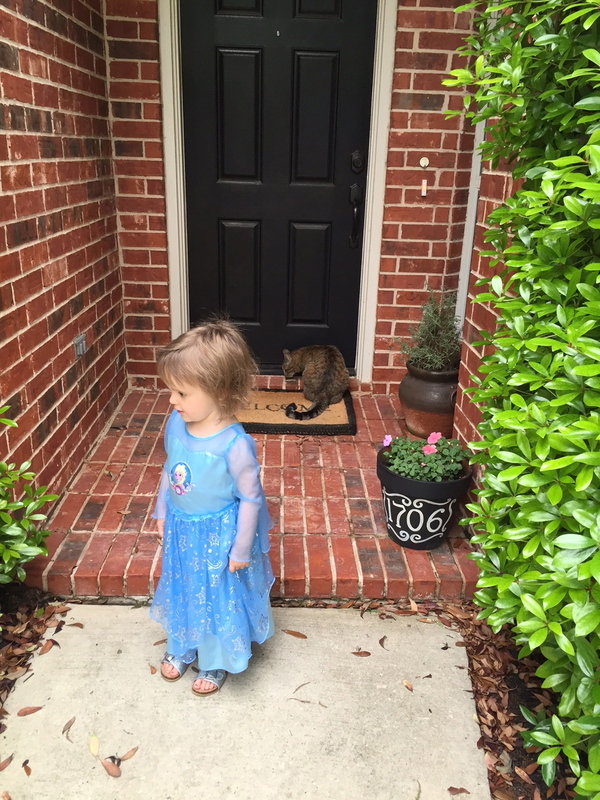 LL sashayed around the neighborhood in her “Elsa” dress. And she looked fabulous.) 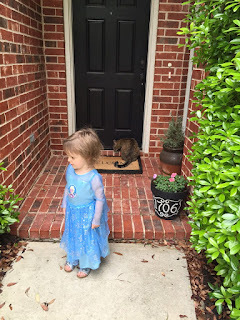 As we came up to LL’s front door, there was The Cat. Like he/she was waiting for us to let him/her in—for a snack or nap or to slink around being nosy and slightly condescending. LL was so sincerely happy to see him/her. Grammy wasn’t sure she should be trying to pet this cat—so I did my best to encourage LL to simply observe. TLC was never completely sure who, exactly, this cat belonged to and was careful to keep LL at a distance—not knowing about shots, etc. LL has, of course, grown up with Morty and has adored him from the moment they met. If you’ve followed us for awhile, you know Morty was actually TLC’s cat. Until he started tearing up her furniture and waking her (not Her Hubby) up at all hours of the night. My Sweet Hubby (MSH) and I had lost one of our two cats (to the wilds of the “country”), and were talking about getting another one, when I suggested we take Morty off of their hands/out of their house. Don’t y’all think our feelings/opinions about cats often come from our early years and whether or not our family had a cat—or dog—or both—when we were growing up? My parents were NOT “cat” peeps. We only ever had dogs. (In fact, my parents were borderline rude about cats.) MSH’s family only ever had cats. I didn’t dislike cats. I just didn’t understand them. They seemed “snobby/snotty” to me. Unfriendly. Cold-ish. Our first dog was a Basset Hound. Named Junior. He was a year old. The woman who owned him owned his mother, too. Junior had gotten HUGE and rowdy. A mutual friend had known MSH had always loved Bassets—so she got us connected with this woman and we happily adopted him. Junior was mostly an outdoor guy. He had a sweet personality—you just didn’t want him to jump up on you. He could knock even a sturdy person back—a smaller person could be knocked completely on their you-know-what. Once TLC saw the little bundle of fuzz in his arms, it was over for moi. We had our first cat. TLC named her Crystal. I don’t remember why. Crystal lived mostly inside our home and, much to my amazement, I didn’t suffer too often with allergy issues. In fact, I doubt she ever really caused me a bad, itchy eyes’ attack. We had Crystal for about six years. One morning, after I took TLC to school, there was Crystal, ahead of me, in the road. She'd been run over, twenty yards past our house. I knew she was gone. I was devastated. I had to beg a friend’s husband to come pick her up for me, cradling her in a blanket she loved. (As always, during these kinds of crises, MSH was out of town.) We all cried for weeks. After Crystal, we had two more cats—pre-Morty. Keegan was a female, 6-toed, grey kitty Tracey got from a school friend about five years before we moved to the country. As we were packing to move, we decided Keegan was going to need a companion—since she was going to be residing at our Barn. Cobbler, a male grey and white kitty came from another one of Tracey’s friends. He was about seven weeks old when we picked him up and moved him out to our place. He lived to be about eleven. He was a hot mess. He made it clear to Keegan that he was The Boss. Sadly, he got sick on Thanksgiving Day, four years ago, and never recovered, despite our Sweet Vet’s extraordinary efforts to save him. When Morty joined us, he got along with Cobbler—considering they were both male. 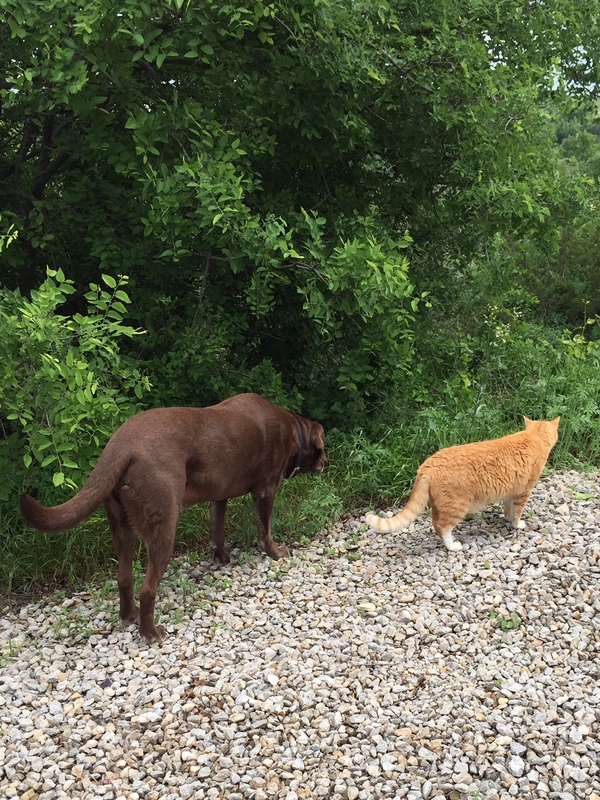 Both cats endured the adoption of our Brown Lab—Buddy Boo Bear—four years ago. I've always suspected Morty and Buddy were a bit too much for Cobbler. Bless his heart. I think Morty was confused—and sad—when Cobbler was no longer around, but he didn't have much time to grieve. Buddy Bear was/is a constant challenge to, and for, him. They basically tolerate each other. Every now and then Buddy will chase Morty up into the woods behind our house. MSH thinks Morty doesn’t mind. I think it annoys the heck out of Morty. He was here first! Cats. Dogs. Pets. Not sure what we’d do without them. 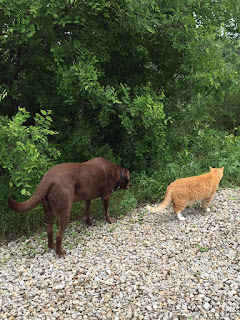 MSH and I sometimes speculate we'll have no more—once Morty and Buddy are gone. We can’t bear the thought of the pain and anguish we’ve suffered in the past—losing our beloved animals that became important members of our family. Hopefully, we'll have both of these Two Sillies for many more years to come.